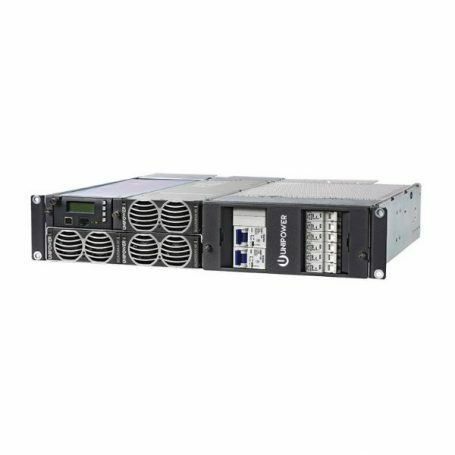 The Unipower Guardian Access 2U 100 amp dc power system is a 2U high 19″ rack-mounted, integrated dc power system providing an output of -48Vdc. These systems can accommodate up to 3 Guardian family high efficiency hot-swap rectifiers. The Guardian access 2U system provides a total load current of 100A / 5.4kW is available with battery charge current up to 65A in addition. The rectifiers are internally fan cooled with speed control which is a function of load and temperature, keeping acoustic noise to a minimum. The Guardian Access 2U is compatible with Unipower’s free PowComsoftware which offers local and remote management through an advanced Windows GUI.